Photo by Tim Green via Flickr Creative Commons – ironically, it’s one of those American machines. Samuel Payne knew what he would miss most if the family business had to close. It was the fascinating smell of hot metal as it ran into the moulds of the machine works. He’d started bottling it, mixing it with the aetheric airs he’d ordered from London and Edinburgh. In the scant few hours of wakefulness when he wasn’t with his father managing their works or arranging shipments out of Otley, he watching the swirling currents in those jars of extraordinary air, the gas that lifted airships mixing with that of a Yorkshire factory floor. Cursing to himself had become habit, a way of blowing of steam. He couldn’t do it in front of his father, a staunch Methodist, or the workmen for whom he was meant to set an example. So it was when he got home, exhausted and soaked with the sweat of the factory floor, that he let rip, swearing up a storm with only his aetheric jars for company. It took him weeks to realised that the jars were swearing back. When he spoke, the air inside them shifted like a heat haze above a road, and as dawn broke that shimmer would return, setting the jars to vibrating. As they shook, they softly echoed his curses back at him. This, he realised as he stared at them in amazement, this was the stuff of science. It was the stuff of invention. It was, he thought as he scribbled a design on a scrap of paper, the stuff that would save the factory. “You’re talking nonsense, son,” David Payne shouted over the clatter of hammers. He waved at the empty side of the factory. In the darkness before dawn, the sound of a single hammer echoed through the factory. It was interspersed with the squeak of bolts being tightened, the click of gears slotting into place, the rattle of machinery being tested. Drive gears, drum flyers, interleaving arms, banjo pinions, piano plates… Samuel assembled familiar parts into a new and exciting device. On the top, perched on sensitive springs, sat his jars of aether. Curious faces gathered around, every man in the works coming to see what Samuel’s strange machine, with its hundreds of tiny printing arms and its glass jars at the top, was going to do. Samuel pulled the lever that started it up and steam poured through the pipes, just enough to power the device, not so much it would shake the jars. Carefully ascending the steps at the back, he leaned in close to the glass. Applause broke out around the factory. The machine went mad, filling a sheet with gibberish, but Samuel didn’t care – the pride on his father’s face made it all worthwhile. The men took turns speaking into the jars, beaming as their words emerged as paper and ink. Then, as they prepared to return to work, someone opened the shutters on a high window. Sunlight hit the jars, and the air inside them trembled in familiar patterns. They shook, and the machine sprang into life. A stream of curses emerged on the paper, an echo of Samuel’s old words, each one neatly typed. Samuel stared in horror from the text to the face of his stern, Methodist father. All around them men were laughing, but David Payne looked deeply unimpressed. Nodding sadly, Samuel pulled the lever to switch the device off. As he slouched away from it, a gentle hand touched his shoulder. He turned to see his father smiling at him. I live in Otley, a small town in Yorkshire. 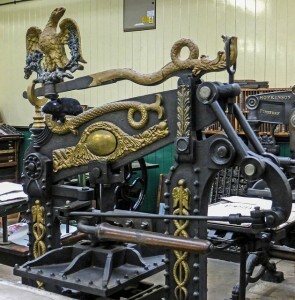 A few weeks ago, I stumbled across a short book on the town’s Victorian printing machine manufacturers. Machines + Victorians + the place I live = obvious story inspiration. If you enjoyed this then you might like also enjoy Riding the Mainspring, my collection of steampunk short stories. You can get a copy for free by signing up to my mailing list, on which you’ll also receive short stories straight to your inbox every Friday.